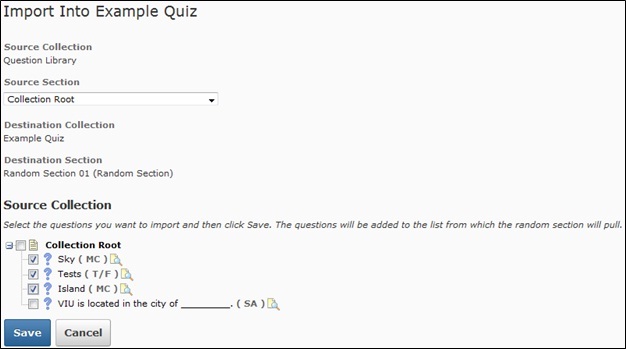 The quiz tool in Desire2Learn is pretty cool. I like that you can have the quiz graded and the grades exported to gradebook automatically. In addition to being able to see different types of reports on your students’ results, you can also set limits on time and number of attempts. My favorite aspect of this tool, however, is the ability to randomize the order in which questions appear to students. This one is a little tricky. 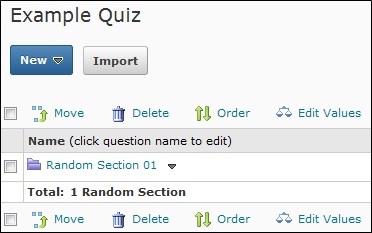 It is easier to create a new quiz and add a random section then it is to randomize a completed quiz. I would also suggest that you have your questions prepared in the question bank, instead of trying to write them while creating sections. To randomize the question order of this quiz, simply click on the blue New button, and select Random Section. The purple folder is a random section. Open it by clicking directly on the blue text (in this example: Random Section 01). Click on the button, and use the drop down menu to select the question bank your questions are in. From there, you can select all questions, or just the ones you want. After your selection is complete, click Save. You should be taken to a new screen. You can select how many questions will be pulled from that section (if you want all of them, type the total number of questions in the section). When finished, simply select Done. 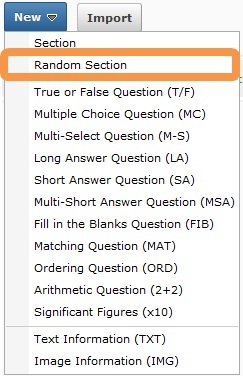 You can insert other, questions that will not be randomized before or after your random section, as well as inserting multiple random sections. You can also include questions from many different question banks in the same random section if you want.